The Burren hedgerows are full of plants and flowers that have been used to make medicine since ancient times. 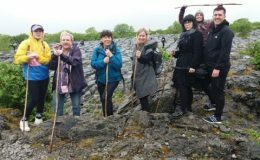 Lisa Guinan is an experienced Irish Herbalist who can walk you down the country lanes and open your senses to the world of plant medicine that mostly goes unnoticed by the untrained eye. Identification, traditional folklore and modern uses will be covered. Please bring along a camera if you would like a photographic record and also some writing material to take notes. Children are welcome to come along for free. Meet: Cassidys pub: 3pm sharp. Cost: €20. Group rates available.